It's giveaway time! I'm teaming up with one of my favorite-est ladies to do a giveaway!! Have you been eyeing the perfect Holiday product? Well, so have I! 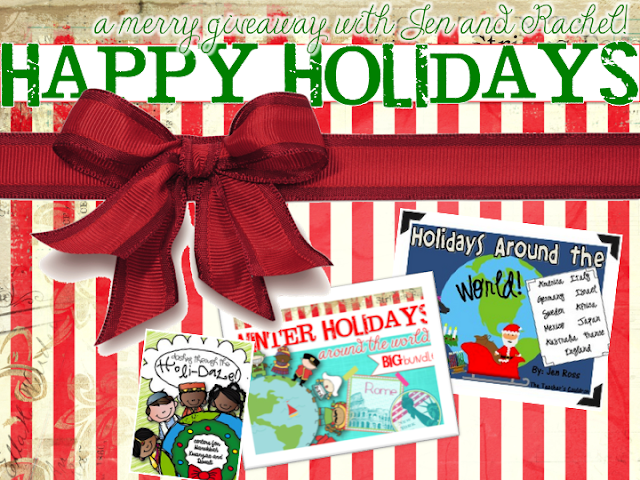 Rachel and I are giving away all you need for the perfect December in your classroom! TWO winners will get my Holidays Around the World pack, Rachel's Winter Holidays Around the World plus her Dashing through the Holiday Daze centers! We will each choose a winner on Tuesday! This giveaway looks awesome! The rafflecopter is not open yet. Thanks so much for this give away!